A small reservoir surrounded by a community in Los Angeles County, California situated in the Santa Monica Mountains. Fishing on Malibou Lake, 1975. Photo by Charles O'Rear. Malibou Lake is a small reservoir surrounded by a residential development in the Santa Monica Mountains near Agoura Hills, California. Adjacent to Malibu Creek State Park and within the Santa Monica Mountains National Recreation Area, it is situated between Malibu Beach and the Conejo Valley. It was created in 1922 after the Malibu Lake Club Dam was built at the confluence of two creeks. The lake, and community of 250 residents are private. The 350 acres (140 ha) site includes rugged mountain terrain, exclusive ranch houses, cabins and a club, It has been a popular venue for filming due to its proximity to the Hollywood studios. About 100 Hollywood movies have been filmed since the silent film period. The Chumash, Native Americans, territory extended loosely from the San Joaquin Valley to San Luis Obispo to Malibu, as well as several islands off the southern coast of California. They named this region "Humaliwo" or "the surf sounds loudly." This name was included within the name of Rancho Topanga Malibu Sequit. The "o" was added to avoid confusion with Malibu Lagoon. In 1922, George Wilson and Bertram Lackey bought 350 acres (140 ha) of land near Cornell with the vision of creating a remote residential community surrounding a lake. In 1922, they formed the Malibou Lake Club (later the Malibou Lake Mountain Club). For nearly four years Malibou "Lake" remained dry. Because of this, the Malibou Lake Mountain Club received criticism from early cabin owners, who had purchased properties for up to $700 along roads such as "Lakeside Drive". Finally on April 5, 1926, a storm produced nearly five inches (130 mm) of rain. The hillsides nearby drained millions of gallons of water into Medea and Triunfo Creeks and Malibou Lake was filled for the first time. The founding members threw a party that lasted for days. The club land is rich with live oak and Sycamore trees, and the trees of the riparian woodland. Built in 1924, the Malibou Lake Clubhouse had 24 bedrooms, a lounge, a dining room, a stage, locker rooms, a trading post, a tennis court, rowboats, and swimming/changing facilities. It was replaced with a smaller structure after the clubhouse burned down in 1936. The 1936 clubhouse by early Los Angeles architectural firm Russell and Alpaugh stands today. The Malibou Lake Mountain Club clubhouse has a 2100 sq ft ballroom and a 475 sqft receiving room, a 1500 sqft patio, immediately adjacent gardens, a swimming pool and a tennis court and 18 ensuite 10' x 13' club member guest rooms (guest rooms not in use). Winter rains were expected to refill the lake in late 1959 when state safety officials had the lake partially drained so the dam could be inspected. Attempts by a rainmaker to resurrect it were initially unsuccessful. the rains finally poured down in 1961 and refilled the lake. Over the past few decades the community of Malibu Lake has proved successful in preserving the lake area and resisting various proposals for mass development in the area. The 2018 Woolsey Fire burned through the area, destroying more than 30 homes. Malibou Lake is located in the Santa Monica Mountains, half a mile south of Mulholland Highway, and over the hill, north of Malibu. The Ventura (101) Freeway is approximately 3 miles (4.8 km) to the north. The Malibou Lake area includes parts of Point Dume and Thousand Oaks. 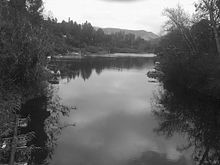 The lake sits at the bottom of a sharp defile where the confluence of Medea and Triunfo Creeks forms Malibu Creek. Here, the canyon floor widens into a valley that includes the lake, which occasionally dries out. The lake is situated in the midst of the Santa Monica Mountains Recreation Area. The lake periphery measures 1.9 mi (3 km) and its shores are studded with many film settings and homes. The depth of water in the lake is ranges to 25 ft which provided the ideal location for the heroes of the film Butch Cassidy and the Sundance Kid to jump from the top of a cliff. A similar stunt act of jumping into the lake was performed by James Coburn, for the film “Our Man Flint”. The Santa Monica mountains and the Agoura hills, which form the catchment of the lake, and the creeks which drain into the lake are adjacent to Malibu Creek State Park. These locations were part of the CBS-TV series M*A*S*H and a ranch where Ronald Reagan came to relax. A gated dam-bridge is located at the lake's southern end. When the area receives 4 inches (100 mm) or more of rain, the lake often overflows. The water flows down Malibu Creek to the ocean at the Malibu Lagoon. Malibou Lake holds more than a 100 film credits. Ronald Reagan, President of the United States, owned a large ranch nearby. In 1953 he was named the honorary mayor. ^ a b c d e f g Rasmussen, Cecilia (November 4, 2007). "Malibou Lake has played its part in movie history". Los Angeles Times. Retrieved 2011-01-08. ^ a b c d e f g h Pitt, Leonard; Pitt, Dale (1997). Los Angeles A to Z: an encyclopedia of the city and county. University of California Press. pp. 313–. ISBN 978-0-520-20530-7. Retrieved 13 January 2011. ^ "Malibu Lake Club Dam". Geographic Names Information System. United States Geological Survey. ^ a b c "History of Malibou lake". Official web site of Malibu Lake. Retrieved 10 January 2011. ^ Sampson, Mike. "Humaliwo: An Ethnographic Overview of the Chumash in Malibu". California State Parks. Retrieved 12 December 2018. ^ a b c Hampar, Susan (July 13, 2010). "The Low Down:Malibou Lake". Agoura Hills Patch. Archived from the original on 2011-07-15. Retrieved 10 January 2011. ^ "Malibou Lake Mountain Club". Geographic Names Information System. United States Geological Survey. ^ a b Federal Writers' Project. Los Angeles: A Guide to the City and Its Environs. US History Publishers. p. 383. ISBN 978-1-60354-053-7. Retrieved 13 January 2011. ^ a b "History". Malibou Lake Mountain Club. Retrieved 13 January 2011. ^ Rivellino, Dolores (November 2007). The Malibu Cookbook: A Memoir by the Godmother of Malibu. AuthorHouse. p. 188. ISBN 978-1-4259-1434-9. Retrieved 13 January 2011. ^ Vives, Ruben (November 10, 2018). "In Malibou Lake, one woman's simple answer for why she didn't evacuate: 'My house. It's all I got.'". Los Angeles Times. Retrieved 18 December 2018. ^ Jaeger, Edmund C.; Smith, Arthur Clayton (January 1966). Introduction to the natural history of southern California. University of California Press. pp. 88–. ISBN 978-0-520-03245-3. Retrieved 10 January 2011. ^ Geological Survey (U.S.) (1961). Geological Survey bulletin. U.S. Dept. of the Interior, Geological Survey; Washington, D.C. pp. 461–. Retrieved 10 January 2011. ^ Federal Writers' Project. Los Angeles: A Guide to the City and Its Environs. US History Publishers. pp. 383–. ISBN 978-1-60354-053-7. Retrieved 10 January 2011. ^ a b Rasmussen, Cecilia (January 21, 2007). "Local peaks were a convincing cinematic stand-in". Los Angeles Times. Retrieved 10 January 2011. ^ "Three Magical Miles". Media: Los Angeles Times. Retrieved 10 January 2011. ^ "Hiking Malibu Creek". modernhiker.com. February 13, 2009. Retrieved 10 January 2011. ^ Stewart, Jocelyn (February 15, 1992). "Flooding a Part of Life on Shores at Malibou Lake Aftermath: Residents who returned to their homes to assess the damage take it in stride. Such disasters are a part of the community's history, they say". Los Angeles Times. Retrieved 10 January 2011. ^ Loesing, John. "Author tells rich and colorful history of Malibou Lake". theacorn.com. Retrieved 2011-01-09. ^ a b c d e f Medved, Harry; Akiyama, Bruce (27 June 2006). Hollywood Escapes: The Moviegoer's Guide to Exploring Southern California's Great Outdoors. Macmillan. pp. 273–. ISBN 978-0-312-30856-8. Retrieved 10 January 2011. ^ a b c d e f Schneider, Jerry L. (2014). Western Movie Making Locations Volume 1 Southern California. Lulu Press, Inc. Page 164. ISBN 9781312711556. ^ Laura Randall (1 April 2006). 60 hikes within 60 miles, Los Angeles: including San Bernardino, Pasadena, and Orange counties. Menasha Ridge Press. pp. 68–. ISBN 978-0-89732-638-4. Retrieved 10 January 2011. ^ Mank, Gregory William (13 May 2009). Bela Lugosi and Boris Karloff: the expanded story of a haunting collaboration, with a complete filmography of their films together. McFarland. pp. 85–. ISBN 978-0-7864-3480-0. Retrieved 10 January 2011. ^ Beale, Lauren (June 30, 2010). "Craig Sheffer puts Malibou Lake home on the market". Los Angeles Times. Retrieved 9 January 2011. ^ McKINNEY, JOHN (January 14, 1989). "On What Was Once Reagan's Ranch, a Trail to the Chief". Los Angeles Times. Retrieved 23 January 2018. ^ Sutherland, James (4 September 2008). Ronald Reagan. Penguin. pp. 245–. ISBN 978-0-670-06345-1. Retrieved 10 January 2011. Wikimedia Commons has media related to Malibu Lake. This page was last edited on 20 April 2019, at 17:55 (UTC).